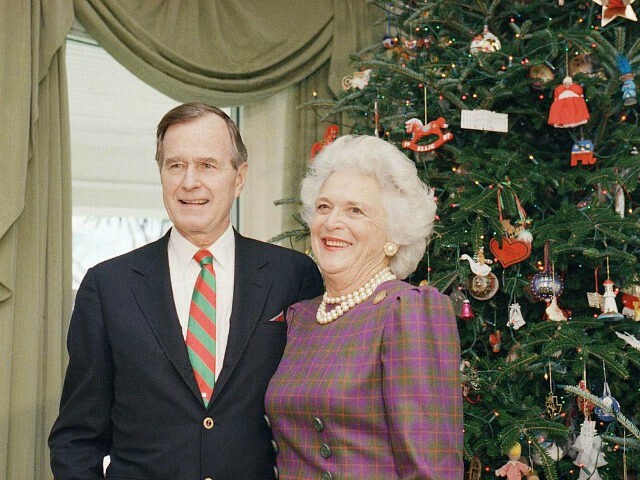 Retired Lt. Col. and National Rifle Association (NRA) President Oliver North recalled how former President George H. W. Bush hosted him at a Bush family Christmas at a time when he was considered politically “radioactive” across Washington, DC. North shared a personal anecdote of George H. W. Bush with Breitbart News Editor-in-Chief Alex Marlow on Tuesday’s edition of SiriusXM’s Breitbart News Daily. North noted Bush’s role in the Chichi Jima incident, in which the former president was shot down as an airman in 1944 near Tokyo, Japan. Bush was the only survivor of nine airmen who had escaped their disabled aircraft. Twice [George H. W. Bush] went in the water, when his airplane was shot down, lost his other two crew members, they were dead in the aircraft. He parachuted out [and] was rescued by a submarine. Distinguished Flying Cross from World War II. Extraordinary courage demonstrated by what was then the youngest pilot in the United States military. I went with [George. H. W. Bush] down to the inauguration of President Alfonsin in Buenos Aires, the first democratic election in Argentina in, I guess, 50 or 60 years. On the way back, he made a secret trip to El Salvador. Now, not a lot of folks listening to this radio show remember what El Salvador was like in those days, but it was under assault from a communist dictatorship next door from Nicaragua. The FSLN — which is a terrorist group — threatened the government every day, and there were right-wing death squads wandering all over the place. They were trying to get more help from the U.S. military. So he’s in the meeting with President Alfonsin at the presidential palace, and in come the 31 “commandantes” — as they called themselves — who are heading up these very brutal death squads. President Reagan had asked [George H. W. Bush] to meet with those guys, if it was possible. So President Magaña summons him to his palace, and he’s in a private meeting with Vice President Bush. A lot of people don’t know this, but [George H. W. Bush] spoke fluent Spanish, so he didn’t need an interpreter with President Magaña. The vice president looked at them and said, ‘I told them I was going to go in there. I’m going in there, and you’re not going to stop me.’ He went back in and finished his meeting with President Magaña, came out, took off his jacket so they could see he wasn’t wearing a vest or carrying a sidearm, walked into that meeting and laid down the law that if they didn’t hold the election as was scheduled in a matter of months, then the United States was going to cut them off at the knees. In other words, he was using the military assistance as leverage. At the end of the day, it worked. I don’t know whether they intended to do something, or not, but they were awed by this man’s courage, and it changed the direction of all that was happening in that country, and brought forth a democratic election. Marlow invited North’s comments on news media bias related to Bush’s death. North explained, “The mainstream media is not only biased by what they tell us and what they don’t tell us. They’re also practitioners of revisionist history. … George Herbert Walker Bush today is being portrayed as a moderate guy and wonderful get-along-with-everybody kind of person. The fact is, he was a very tough guy. The jury in my trial — which you never saw in any newspaper [or] on television; nobody ever mentioned it, the press was there every single day, the jury was seated every day — was an all-black jury. Now, I got a fair trial. I’m not arguing that, except only that there was evidence they should never have used, but the press never reported that. Can you imagine what would happen today if a black man was tried by an all-white jury somewhere? Every day that would be pointed out and yet the media, truly, by not telling the American people what was going on in that courtroom tried to change the perspective on it. They never once mentioned that it was a white boy on trial in front of an all-black jury.